Antibiotics are powerful medications that slow down or destroy bacteria growth, and are used to treat diseases caused from bacteria, including pneumonia, fungal infections, strep throat, ulcers, acne, ear infections, meningitis, and food poisoning. However, antibiotics can lead to unwanted side effects and antibiotic resistance. That is why a more natural way to fight bacteria with antibacterial essential oils is recommended. Even if synthetic antibiotics eliminate the problem, they are likely to cause another one. Common antibiotic side effects include feeling sick, diarrhea, and fungal infections of the digestive tract and mouth. Antibiotics can also interfere with hormones, brain function, the endocrine system, and much more. It is important to note that antibiotics do not treat viral infections or acute respiratory tract infections like bronchitis, pharyngitis, sore throats, sinus and some ear infections, and the common cold. That is why it is a major concern that overuse of antibiotics being prescribed, can make bacterial strains antibiotic-resistant. In other words, taking antibiotics too often or when they aren’t necessary, can make your body resistant to them. They will no longer work, because the infection you’re trying to fight, becomes resistant to the medication due to its widespread use—and that can also include antibacterial hand sanitizers. The Centers for Disease Control and Prevention (CDC) estimates that antibiotic overuse has lead to 2 million antibiotic-resistant illnesses and 23,000 deaths each year. It is very useful that people opt for antibacterial essential oils instead. Essential oils have been known to exhibit antibacterial activity for a long time. For instance, a study published in the Journal of Applied Microbiology in 1999 tested 52 essential oils against various bacterial strains, including salmonella, candida, staph infections, pneumonia, and skin infections. The essential oils that the study specified as being the most effective were vetiver oil and thyme essential oil. 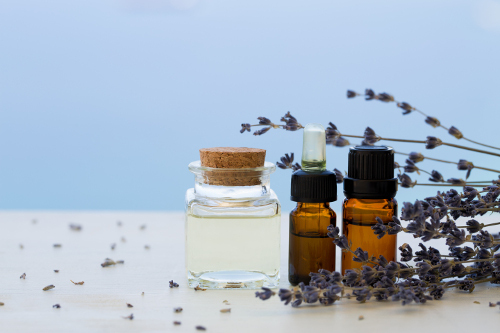 Several other essential oils have been studied against various staph infections, including lavender oil, geranium oil, tea tree oil, grapefruit oil, and patchouli oil. The oils provide antibacterial activity against three strains of Staphylococcus aureus. Tea tree oil and eucalyptus oil have also been used in hospitals to fight various strains of bacteria that have become resistant to other medicines. Other testing found that lemon, cinnamon, lemongrass, and thyme essential oils showed effective antibacterial protection as a topical treatment. Essential oils may also be able to fight MARCoNS, which are a strain of bacteria known as multiple antibiotic-resistant coagulase negative staph. MARCoNS are challenging because they form a protective biofilm to protect itself from treatment, including antibiotics. Research published in Applied and Environmental Microbiology in 2012 found that essential oils were able to get rid of bacteria within biofilms more effectively than antibiotics. Cinnamon essential oil, in particular, may be useful in the fight against MARCoNS. Antibacterial essential oils can be a great way to fight bacteria without experiencing the severe side effects associated with antibiotics, or the harsh household cleaner chemicals. There are many antibacterial essential oils available, but some stand out better than others. For the purpose of this article, the following are the top seven essential oils with antibacterial properties. Oregano essential oil has been found to protect against bacteria strains like salmonella, E. coli, and staphylococcus. A study published in Frontiers in Microbiology in 2016 found that oregano oil and colloidal silver have antibacterial activity against some drug-resistant strains of bacteria. These results indicate that oregano essential oil is an effective alternative to antibiotics for infections. Research published in Physical Chemistry Chemical Physics in 2016 found that tea tree oil was effective against staph infections and E. coli when combined with eucalyptus. The studies found that tea tree oil showed an immediate effect, followed by a slow-release effect over 24 hours. Other studies show that tea tree oil can be used to prevent the spread of MRSA in hospitals and nursing homes. Tea tree oil can be used topically when combined with coconut oil and Manuka honey. The University of Tennessee’s Department of Food Science and Technology has found that thyme oil is effective against bacteria found in salmonella and milk. The results were published in the International Journal of Food Microbiology in 2015, and also indicated that thyme oil as a preservative for food, can be another great option for protecting the body against bacteria. Not to mention, this would be a lot safer than chemicals as a food preservative. Many consider cinnamon essential oil to be the most powerful antibacterial essential oil available. Research published in the Journal of Contemporary Dental Practice in 2016 concluded that cinnamon essential oil is an efficient antibacterial agent against planktonic and biofilm E. faecalis, and can have antimicrobial abilities in root canal treatments. Toothpaste with cinnamon essential oil can help fight mouth bacteria. The antibacterial properties in eucalyptus essential oil are well established, and its antiseptic nature makes it appropriate for treating wounds like burns, sores, cuts, and abrasions. Research published in Microbios in 1996 featured eucalyptus as one of the essential oils effective against 22 bacteria strains and 11 fungi. The antibacterial and antimicrobial properties in grapefruit essential oil may help prevent and treat cuts and wounds, and eliminate microbes in the gut and kidneys. A study published in the Journal of Alternative and Complementary Medicine in 2002 found grapefruit oil was comparable to proven topical antibacterials. Other studies report that grapefruit oil is effective against bacteria strains like E. coli, salmonella, and staph infections. Lemon essential oil has a history in antibacterial cleaners. But its sister, lemongrass oil, is considered sweeter, more gentle, and less sour. However, lemongrass essential oil is just as powerful as an antibacterial. Studies have found that lemongrass is effective against bacterial strains and fungi. It can inhibit bacterial growth internally and externally due to its limonene and citral content. As a result, lemongrass essential oil treats bacterial infections, food poisoning, skin conditions, and bad body odor. Are you wondering how to use your antibacterial essential oils? You can use them topically, internally, and by diffusing them only if they are 100% pure. The following is an antibacterial essential oil tonic to help fight bacterial infections. Combine all ingredients into a glass and stir well. Drink immediately once combined. Antibacterial essential oils can help avoid antibiotic resistance, especially when you use essential oils like tea tree oil, oregano oil, thyme oil, and cinnamon oil. Regardless of the benefits, essential oils need to be used with the proper education. Check with your doctor before using essential oils, and if your doctor does not have any knowledge of them, find a holistic or natural doctor who does. Also, remember to purchase pure therapeutic grade essential oils that are often available through a distributor. “Top 10 Antibacterial Essential Oils,” Herbs for Health; http://www.herbs-for-health.com/ant2017. “Essential Oils Might Be the New Antibiotics,” The Atlantic; https://www.theatlantic. com/health/archive/2015/01/the-new-antibiotics-might-be-essential-oils/384247/, last accessed February 23, 2017.
, last updated January 2, 2017. Hammer, K.A. et al., “Antimicrobial activity of essential oils and other plant extracts,” Journal of Applied Microbiology, June 1999; 86(6): 985-990. https://www.ncbi.nlm.nih.gov/pubmed/10438227. mental Microbiology, June 2012; 78(11): 4057-4061, doi: 10.1128/AEM.07499-11. 3, 2016; 7: 760, doi: 10.10.3389/fmicb.2016.00760. polymer nanocomposite films: a surface active antimicrobial system for biomedical application,” Physical Chemistry Chemical Physics, June 22, 2016; 18(25): 16775-16785, doi: 10.1039/c6cp03493d. e, J., “Antimicrobial activity of thyme oil co-nanoemulsified with sodium caseinate and lecithin,” International Journal of Food Microbiology, Oct. 1, 2015; 210: 1-8, doi: 10.1016/j.ijfoodmicro.2015.06.003. Abbaszadegan, A., et al., “Antimicrobial and Cytotoxic Activity of Cinnamonum zeylanicum, Calcium Hydroxide and Triple Antibiotic Paste and Root Canal Dressing Materials,” Journal of Contemporary Dental Practice Feb. 1, 2016; 17(2): 105-113. https://www.ncbi.nlm.nih.gov/pubmed/27206997.